You can only Special Summon “Sky Striker Ace - Hayate(s)” once per turn. This card can attack directly. 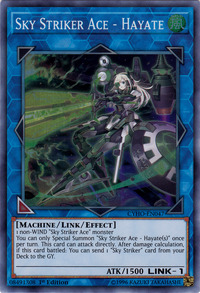 After damage calculation, if this card battled: You can send 1 “Sky Striker” card from your Deck to the GY. This monster is the evolved WIND form of Sky Striker Ace - Raye. This monster's serial number is X-004, carved within the circular shield mounted on the left-side of her waist. In Japanese, Hayate is a reading of the Kanji (疾風, gale, fresh breeze). This is fitting with this monster's Attribute. This monster appears in the card artwork of Sky Striker Maneuver - Vector Blast.